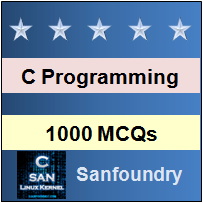 This set of C Interview Questions and Answers focuses on “DMA Functions, Memory Leak, Dangling Pointers – 2”. 1. What is the output of the following code if it is executed on a 32 bit processor? Explanation: The size of a pointer is 2 bytes on a 16 bit platform, 4 bytes on a 32 bit platform and 8 bytes on a 64 bit platform. It is clear from the above example that malloc() takes only one argument as input, that is the number of bytes to be allocated. 3. Suppose we have a one dimensional array, named ‘x’, which contains 10 integers. Which of the following is the correct way to allocate memory dynamically to the array ‘x’ using malloc()? 4. Point out the error (if any) in the following code? Explanation: If malloc() and calloc() are not type casted, they return a pointer of the type void. 6. Pick out the correct statement with respect to the heap. Explanation: Local variables are stored on the stack. Static variables are stored in the permanent storage area. Stack is the data structure used to implement recursive function calls. Hence, it is true that everything on heap s anonymous. Explanation: If pointer is NULL, the call to the function realloc is equal to malloc(size), for any value of size. If size is equal to zero, then the pointer is not NULL and the call is equivalent to free(pointer). Explanation: A garbage collector is a program that automatically removes unwanted data held temporarily in the memory during processing. Hence it frees the programmer from worrying about memory leaks. Explanation: A NULL pointer is returned when the memory allocated by malloc dynamically is insufficient.